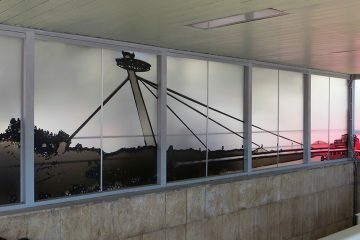 Ottoman Budapest: The artifacts • Where Is Your Toothbrush? 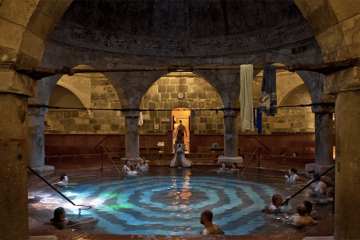 Thermal baths like Rudas and Király are the most visible and tangible and best-known vestiges of the Ottoman occupation of Budapest in the 16th and 17th centuries. The Ottoman Turks left behind several additional structures that survived later destruction and construction, and there are a few other artefacts of long-ago Turkish presence. Take a look at the rest of Ottoman Budapest artifacts. The walk to the northernmost holy site of Islam is steep but mercifully short. At the top of cobblestoned Gül Baba Street we passed through an iron gate into a peaceful yard surrounded on three sides by a colonade, adorned by late-blooming roses. In the corner, two security guards sat at a table, one reading, the other listening to the radio while he watched the entryway. 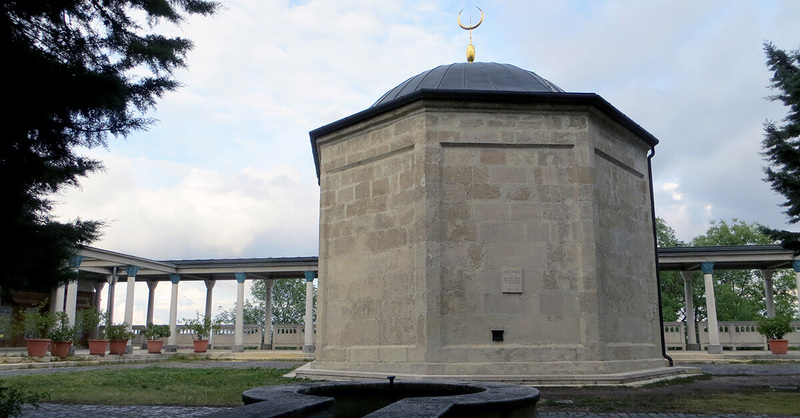 In the middle of the yard stands a domed octagonal building, a türbe, or tomb, containing the remains of the eponymous late 15th/early 16th century Turkish poet and Bektashi dervish Cafer. Gül Baba means Father Rose, a nickname referring to the rose he carried in his hat. 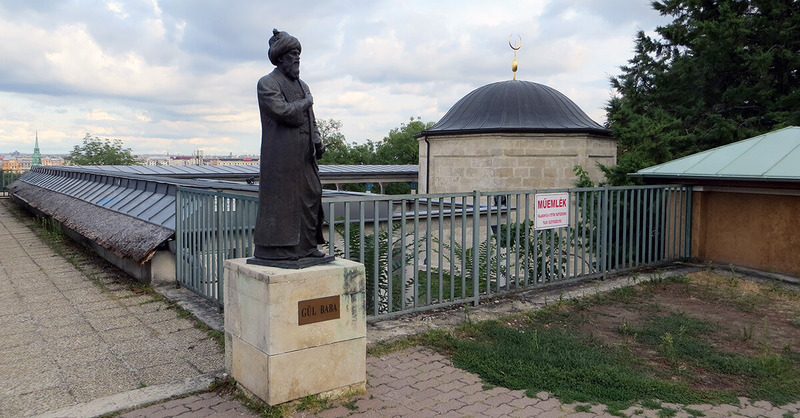 Cafer came to Buda in 1531 on orders from Suleyman the Magnificent to found a dervish lodge. He died in 1541 in battle, and the sultan himself came to his funeral. The lodge itself was torn down after the Turks were expelled. 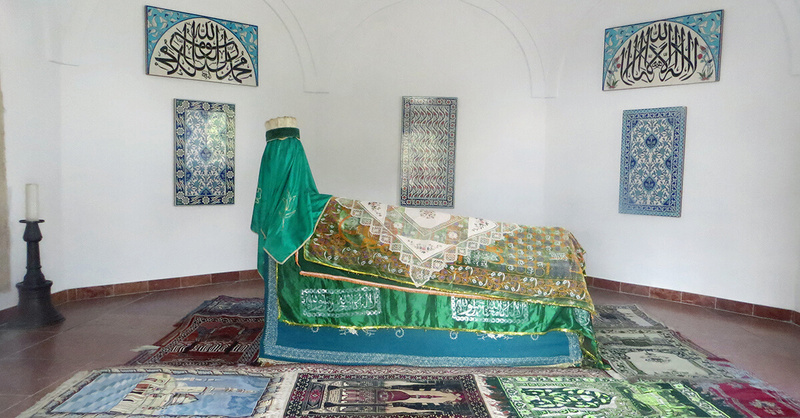 The tomb was built on orders from Mehmet, the Pasha of Buda. 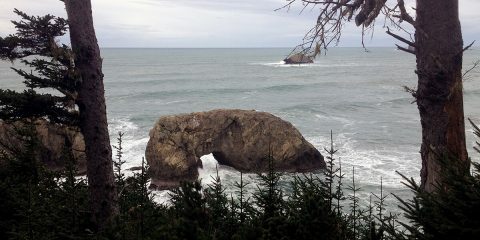 It was last restored in 1997. The site now the property of Turkey. The sarcophagus covered in cloth can be seen through door glass. Standing against the wall in the far corner of the yard is a beautiful sink. 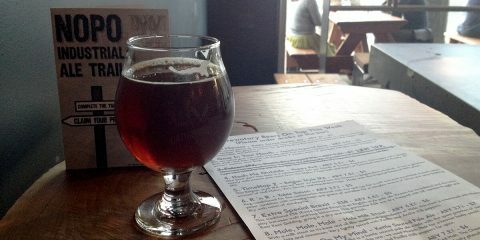 I wished I could read the inscription above the faucet. 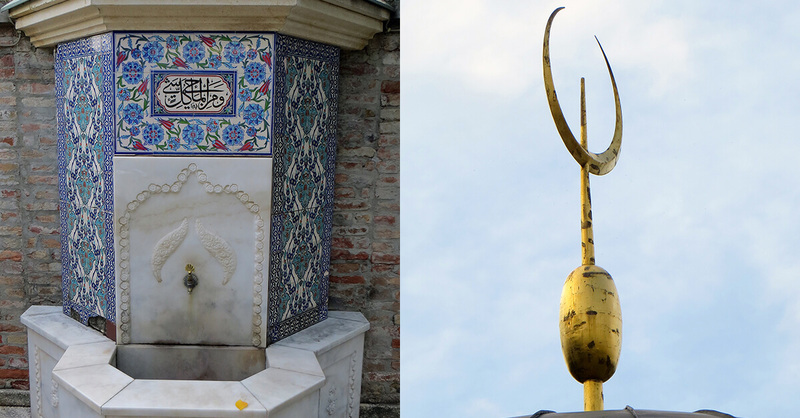 Left: Ritual sink; right: crescent atop the mausoleum. Outside, past a bronze statue of Gül Baba, a walkway leads to a round platform, which offered us a splendid view of Budapest, especially the Margit Island and the parts of Pest across the Danube, bathing in the sunset light. Under the Turks Buda was a provincial garrison town. 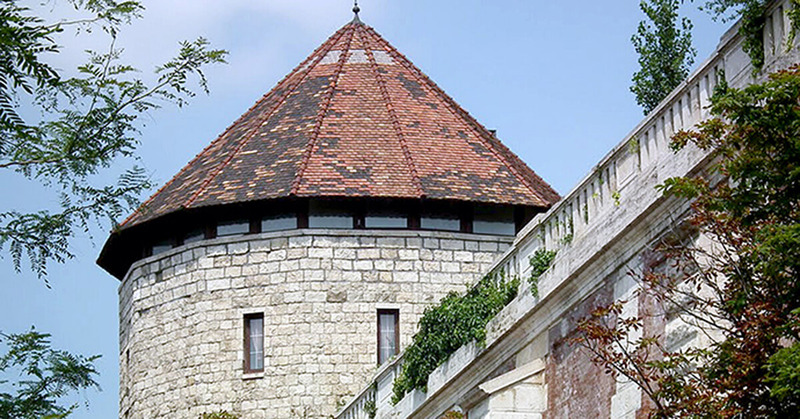 The occupiers therefore built most structures in what is now the Buda Castle area. Many of those were rebuilt afterward by the Catholics, most prominently the Suleyman Mosque, which is now the famous Szent Mátyás Templom, or St. Matthias Church. The best preserved remains of the Ottoman presence are seven structures that are part of Castle fortifications. Bastion of Kasim pasha, today called Fehérvár rondella (White City Round Bastion) – demolished in 1867, rebuilt in 1950-52. Atop the bastion stands a horseman statue. The Karakas Pasha Tower. 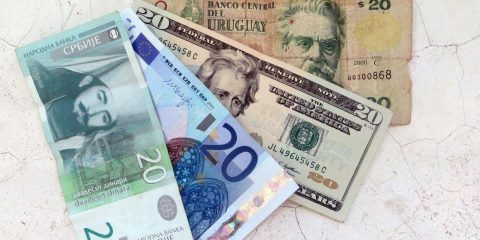 Photo by HCsaba. I did not tour these towers and bastions, so take a look at the Karakas Pasha Tower above and a few others here. In addition, a few tombstones from an old Ottoman cemetery hide away in a park beneath the Castle walls. Turkish graves below the Buda Castle. Photo by Tibor Mester. Through Bécsi kapu (Vienna Gate), on the north side of Castle hill, up the stairs to the right along the Anjou Bastion walkway past the Hungarian National Archive building stands a memorial to Abdurrahman Abdi Arnaut Pasha, the last Pasha of Buda. He perished on this spot on September 2, 1686, in the Battle of Buda. 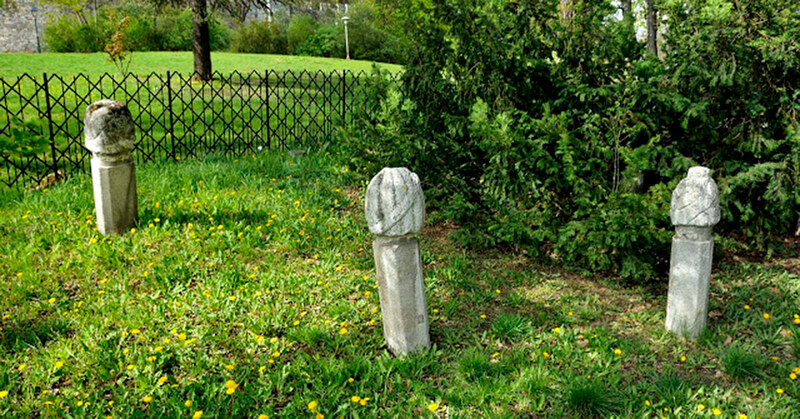 The memorial, resembling an Ottoman grave, was erected in 1932 by the descendants of György Szabó, a Hungarian soldier of the liberating army who also fell on this spot that day. 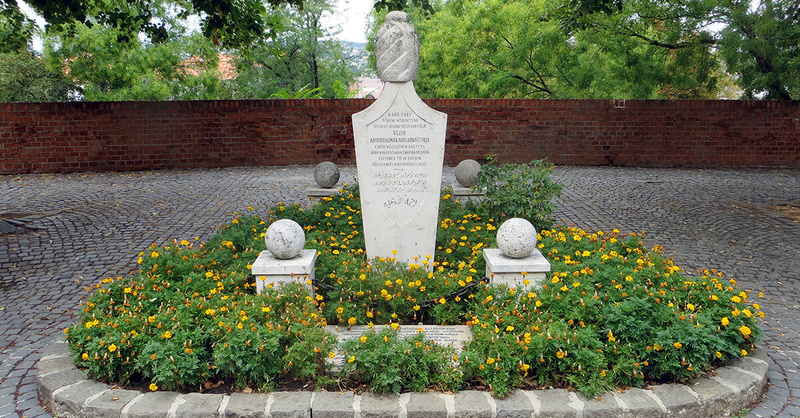 The memorial rests in a solemn location on a not-so-busy part of the Buda Castle fortification, aptly at the bastion built by the Turks and near the Military History Museum. With the wounds of the Ottoman occupation in such distant past it was probably easy to erect a monument to a fallen enemy. Still I appreciated the Hungarians’ magnanimity in appreciating the death in battle of an enemy who inflicted so much pain on their nation. The Capuchin Church at Fő utca (Main Street) stands on the spot of a djami, or large mosque, built by Tojgun Pasha beginning in 1555. 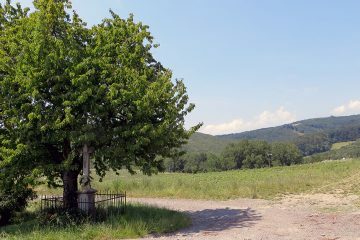 The djami survived the recapture of Buda in 1686 intact, only to be converted and built over by Capuchin monks. Still standing in the church are the remains of an original doorway and window. The downtown Parish Church at the March 15 Square also used to be a mosque. The only part of the mosque that remained after subsequent construction is the mihrab, or a niche in the wall of a mosque pointing at the Kaaba stone in Mecca, toward which the congregation faces to pray. Ruin of house where commanders of the janissary, defenders of the Vienna Gate, lived, at 18 Fortuna Street, on Castle Hill. Ruin of a residence at 5 Tárnok Street. Various artefacts from the Ottoman occupation era scattered around various Budapest museums, including a memorial tablet of the Tower of Mahmud Pasha in the Hungarian National Museum. Around 9.5% of words in the Hungarian language come from Turkish. 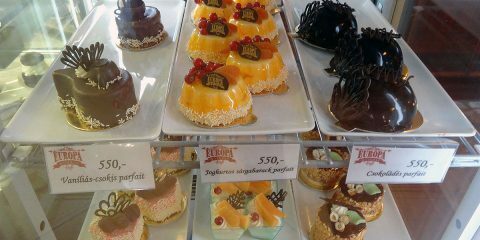 Some are more obvious than others; many old Turkish words in Hungarian are difficult to spot because they are from the Csuvash branch of Turkic languages. 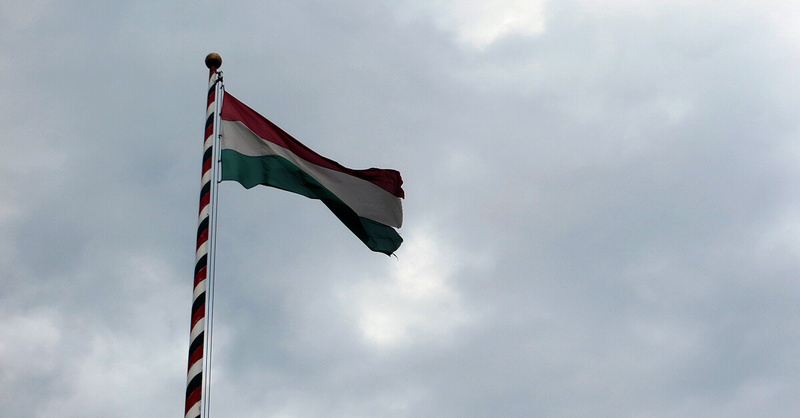 The Hungarian flag at the Buda Castle. 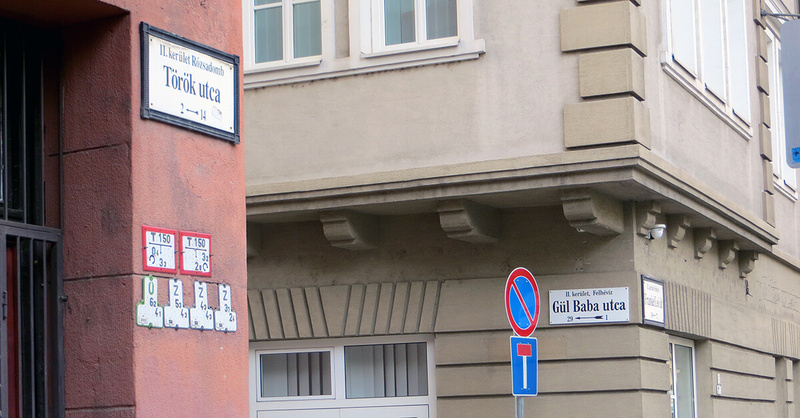 Sources for this blog post included inscriptions on listed buildings, Wikipedia, Hungarian Islam Society, BudapestCity.org, All About Hungary, Magda Somodyi’s paper “New Street Names in Budapest”, and a smattering of other websites and forums.